Tabletop games often thrive on progression. Whether it’s leveling up in a pen-and-paper RPG or taking over the world in a strategy game, getting more powerful or having more options throughout a game is a key mechanism to keep people interested. AEG’s Space Base is an engine-building game that puts players in charge of a space station. Through acquisition of new ships and the luck of the dice, you’ll be racing other players for galactic influence. What is an engine-building game? Engine-building games, like AEG’s Space Base (and CMON’s Gizmos, featured in our holiday tabletop guide) handle this in a slightly different way. Throughout a game, you’ll essentially be setting up domino effects. At the start, only one or two might be in position to fall. By the end, you’ll be knocking over a pile and reaping huge rewards. Like deck-building games, engine-builders have an offering to purchase from. On your turn, you’ll use your funds to purchase new ships and create opportunities for bigger and better combos. Over time, the rewards mount, allowing you to purchase more powerful ships for your fleet. 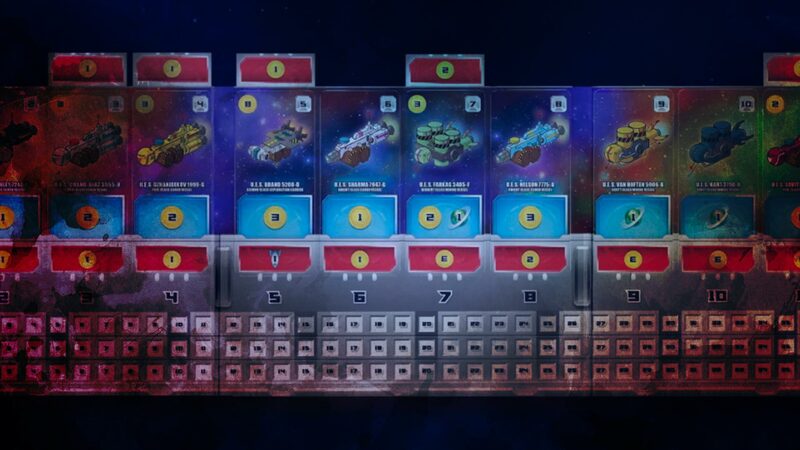 In Space Base, players take turns rolling dice, activating one or more of the 12 numbered sectors, reaping rewards, and buying new ships for their fleets. At the start of your turn, you’ll roll two six-sided dice. You can choose to activate the two sectors corresponding to each of the results or one sector representing the sum. For instance, if you roll an eleven, you can activate sectors five and six or sector eleven. You’ll earn a combination of credits (money to spend on the current turn), income (recurring funding), or influence (victory points). Every player starts with all eleven sectors filled with starting ships and one occupied by an advanced ship. When you buy new ships from the offering, you’ll replace the one currently occupying that sector on your board. The old ship is then “deployed” (slotted above the space it previously occupied, upside down) giving you benefits on your opponent’s turn. While some engine-building games simply make your turns more exciting, Space Base is all about eliminating downtime. On every other player’s turn, you can use their dice rolls to activate the abilities on deployed ships. 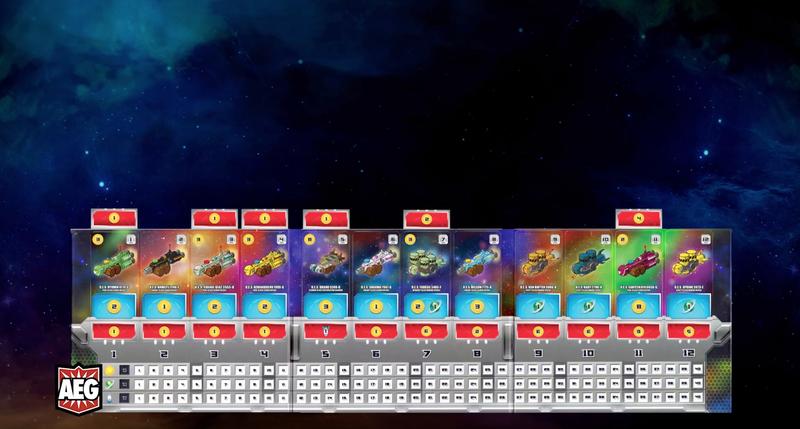 As an example, if the image above represented your board and an opponent rolled a six and a three, you’d be able to activate the red ability for sector three. You wouldn’t receive any benefit from the six or the combined value of nine, because you don’t have ships deployed in those sectors. As the game proceeds, you’ll build up the deployed ships in each sector. In the image above, you can see that there are now two ships in sector eight. If an opponent rolls an eight, you’d get both of the red benefits. How complex is Space Base? Space Base starts off fairly simple, but there are some cards that increase the game’s complexity. There are some abilities that must “charge” before you can use them. Instead of gaining a benefit for that sector, you’ll instead earn a “charge” that can be used at any time. 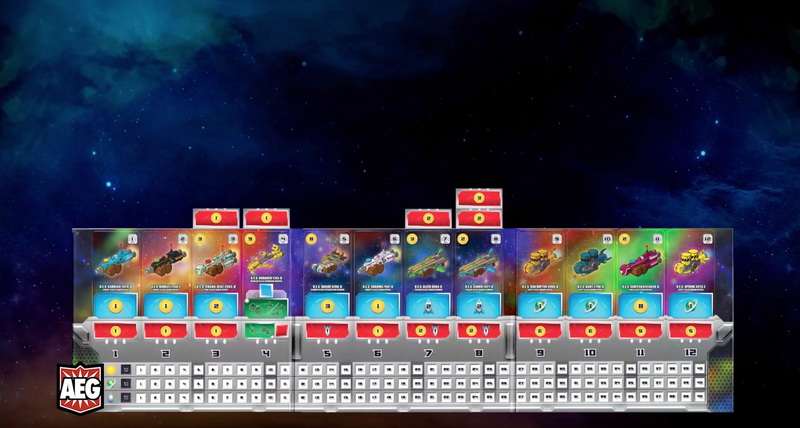 For instance, in the image above, the ship occupying sector four allows you to add one or two to the sum of any roll when spending a charge token. If an opponent were to roll a seven, you could spend the charge token to instead take the benefit from deployed ships in sector eight or nine. Charge abilities took us a bit of time to understand in our first playthrough and some rules and FAQ consultation afterward to make sure we were playing them correctly. Outside that, everything in the game is based on symbols with no reading required. How many players should I have at the table for Space Base? Space Base plays two to five out of the box. We recommend that you start with a smaller player count to get a feel for how the game progresses. Once you have a handle on it, scaling all the way up to five means more opportunities to trigger combos later in the game. It can be a little slow at first, since you only start the game with one deployed ship. But it doesn’t take long to start lining up those dominoes to fall on your opponents’ turns. Don’t bother explaining charged abilities until someone is in a position to purchase one from the market. Let players get a sense for how active and deployed abilities work first. Engine-builders are a lot of fun for people who like setting up big combos and watching them trigger for big rewards. Some of that can be found in deck-builders, but engine-builders like Space Base and Gizmos are built around good planning and maniacal giggling as your carefully laid schemes stun your opponents. While Space Base says it plays in 60 minutes, plan for bit more time than that at higher player counts, when teaching new players, and when introducing the game to your kids. The concept is easy to grasp once you have a few turns under your belt. If you (or your kids) get bored when other players are taking their turns, Space Base has a built-in mechanism for keeping them engaged. However, if they are more likely to have fun with marbles than cards, you might want to look at Potion Explosion or Gizmos as a first step in the genre. It’s easy to recommend Space Base. Just make sure that someone has a firm grasp of the rules, especially around the more complex cards.